It can be so tricky to find FAA approved car seats. Deciding which car seat is in actual fact the best travel car seat can be even more challenging. 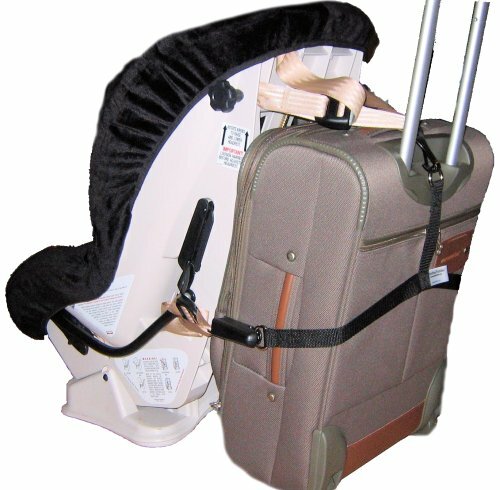 Did you know that you can only use a portable car seat for travel on an airplane if it is has been FAA certified? Now take into consideration that we need to find a lightweight car seat for travel so we can easily port it around and lastly that we also need to find a car seat that is slim enough to fit on the narrow airplane seats. It is no easy feat to find a car seat that fits all of those criteria! But we have managed to find 10 car seats that are fabulous portable car seats for travel, all of which have been approved by FAA. 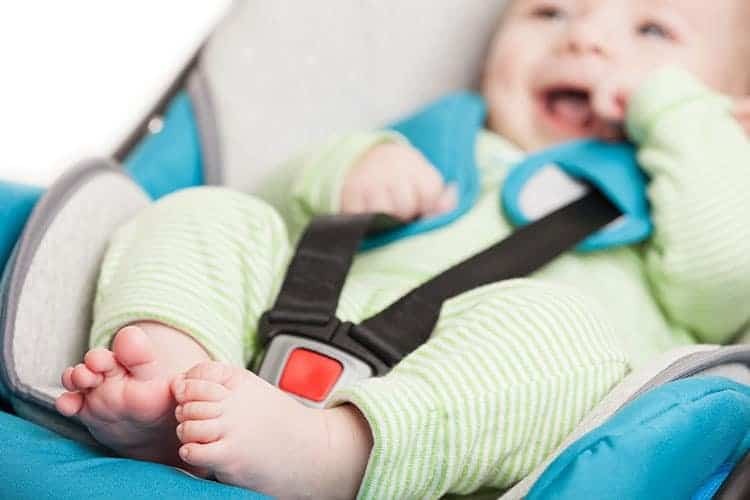 Below you will find a list of FAA approved car seats for 2019. We also share some food for thought about whether you actually need a car seat as well as ideas on how to make it easier to actually travel with the car seat. But for those of you who want the quick and easy answer as to which car seat is indeed the best for travel, you can click below to find out which one received our vote. PS. Here is our guide to the best baby travel gear. 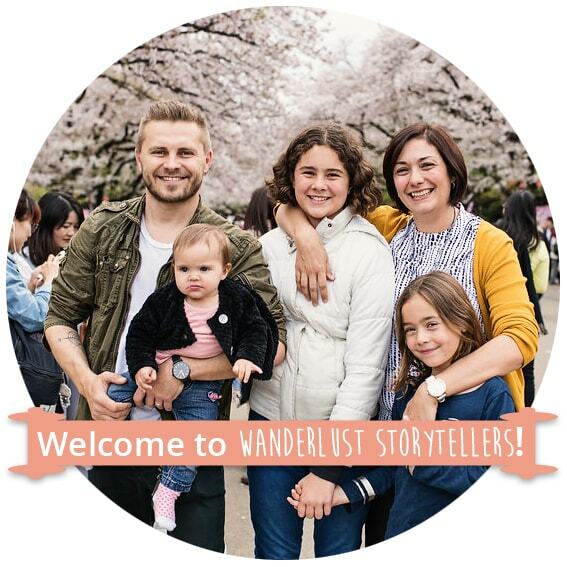 We also suggest you read through our baby travel guide as well. Does My Child Need a Car Seat on an Airplane? In this airplane car seat buying guide, we suggest you check out our comparison chart of the best car seat for air travel and then read our portable baby car seat reviews of the seats that best suit your requirements. 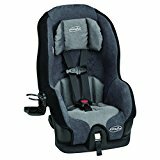 The below reviews are of the best convertible travel car seats, so if you are shopping for either: the best travel car seat for 1 year old, best travel car seat for 2 year old, best travel car seat for 3 year old or the best travel car seat for 4 year old, we got you covered! 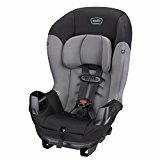 Below is a helpful FAA approved car seat list of all the top rated car seats for travel, which are mentioned in this article. You can then read my reviews below featuring the best car seat for airplane travel that 2019 has to offer. Please scroll right to see full table on mobile. Ultimately the answer to this question comes down to safety and how important your baby or toddler's safety is to you. The American FAA does strongly recommended that you use an approved child restraint device when travelling with infants less than 2-years old. Ultimately car seats are the safest and most comfortable way for infants to travel on a plane. Plus a toddler travel car seat really comes in handy as your child know that they are expected to stay put in the seat. But, in saying all of that, you are not legally required to use a car seat on the plane, so it does come down to your own decision. Of course, you would also need to purchase an additional seat in order to use the car seat on as well, so keep that in mind. A convertible car seat on airplane can be an easy option, allowing for use both rear and forward facing. We prefer a convertible travel car seat over an infant travel car seat. You will also need to ensure that the car seat has FAA approval. Not every car seat can be used on the plane! More information and the best infant car seat for travel below. In order to be allowed to use your car seat on the plane, it must be FAA approved. How do you find out if your car seat is FAA approved? If you are located in Australia, the car seat must be approved to Australian Standards AS/NZS 1754. 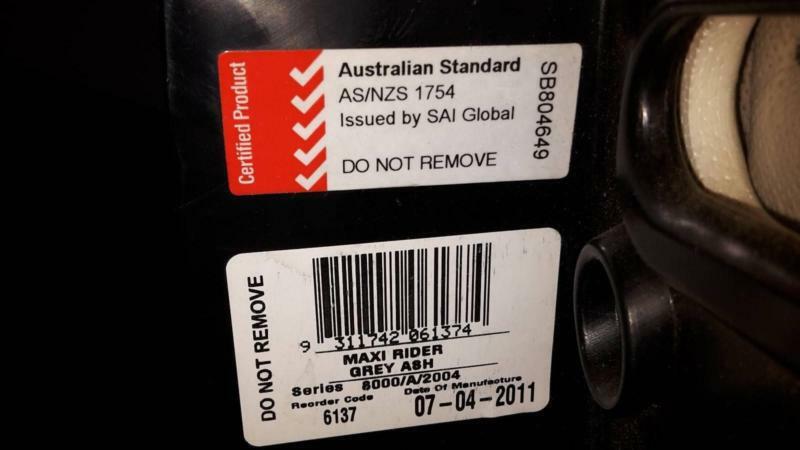 So make sure your seat has an AS/NZS 1754 approved safety label. For a child 22lbs – 44 lbs. : For babies and toddler at this age, you could either use an approved car seat or you could choose to secure them in the airplane seat in a CARES Child Safety Device. 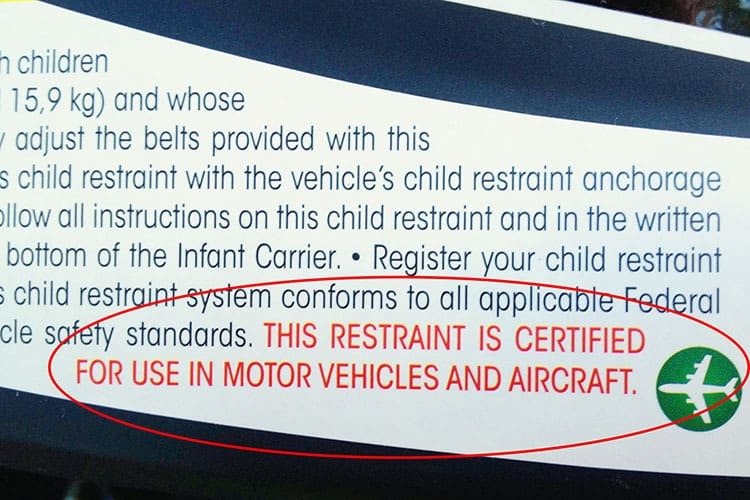 The Cares restraint is the only FAA approved child airplane harness system that is allowed to be used during takeoff, landing as well as in flight. More than 40 pounds: Kids can use an airplane seat belt, however many parents typically keep their child in a car seat till around 3.5 years. The CARES Child Safety Device is the only FAA approved harness restraint for children weighing between 22 and 44 lbs (kids 1-year and older). The benefits of a CARES harness is of course that it is small and portable enough to carry in your carry-on bags. 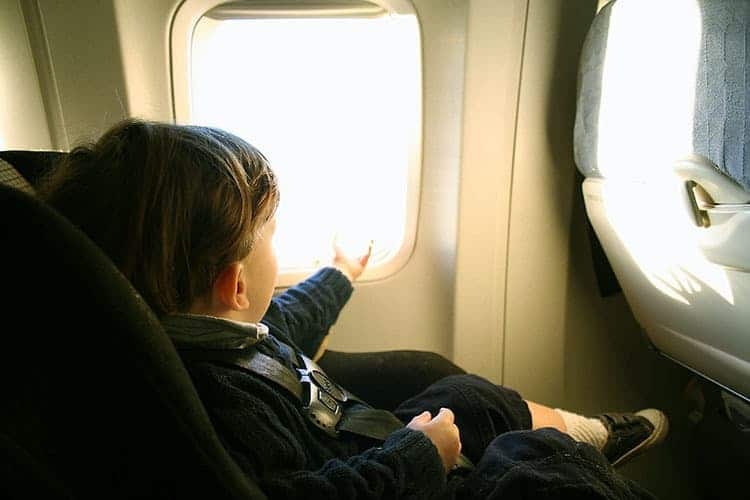 The negatives are that your child will be required to sit up pretty straight on the airplane seats and the harness is really uncomfortable to sleep in. So we do still prefer a toddler portable travel car seat as they are more comfy for kids. >>>Learn more about CARES FAA approved child restraint or check prices for the CARES harness here. Things that you should look out for when purchasing a car seat for travel use. The weight of the seat is important for your own sanity. We prefer a car seat that is around 10 lbs. (slightly over is still okay). You will be required to lift the car seat in and out of the car, on to trolleys, port it around the airport as well as potentially have to lift it over peoples heads on the plane to carry it down the aisle. Stick to a lightweight car seat. Trust me! The width of the seat is another important consideration. Just because the seat has FAA approval does not mean that it will fit on the plane seat. Plane seats can be anywhere from around 16" to 22". Most are around the 17 or 18" mark. You can check to see if your plane is list on the SeatGuru seat chart table to see what size your seat will be ahead of time. We find that child care seats around 18" or under fit on all airplane seats. Although you might have to lift the armrest on the 16" seat planes. Another important consideration with slim designs is so that the seat will fit through the security scanner. If the seat won't fit, the will need to hand inspect the seat and it would slow down the whole checking in process. As mentioned above, you will need to ensure that you purchase a FAA approved infant car seats or FAA approved toddler car seats. When you are shopping for the best car seat for travel, make sure to get the best convertible car seat for travel option there is. Buying a convertible car seat means that you will save money in the long run. Convertible travel car seats can accommodate your child from infant to toddler with ease, from approximately 5 lbs. to 65 lbs. comfortably. With that in mind, please make sure to check out the convertibility features carefully and choose the travel car seat that suits you best. Important to note that you will need to use the car seat in a seat that won't block anyone's exit, so for example a window seat. You will only get away with using your car seat in the bulkhead seats if your car seat is really narrow. Bulkhead seats have fixed armrests, thus reducing the amount of width available for a car seat. You won't be allowed to use the seat in exit rows or where it could block anyone's exit path. Another consideration is that if you use a rear-facing seat, the person in front of the seat might not be able to recline at all. So consider booking one parent to the right of your baby and one in front. Do take the time to make a call to the airline in advance to notify them that you intend to travel with car seat. As extra precaution we also recommend that you request to have this noted to your booking and also ask for written confirmation of approval that you can bring out and take with you on the plane. According to regulations, booster seats are not permitted on-board. Some airlines might let you use the booster seat for flying, but it will need to be stored for take-off and landing, but realistically speaking they can tell you that you are not allowed to use it at all as there are NO FAA approved booster seats. Sorry! Making your way through the airport with a child, luggage, and a car seat can be a challenge. Fortunately there are ways to make your life easier and easier means better! Last thing you want on the airport is an added struggle. You could choose to invest in either a car seat trolley or choose to carry it around on your back with a car seat backpack. You will find different recommended products for both of these options at the bottom of the guide. >>> Click here for more helpful information on using a car seat for plane travel. Below you will find the list of the best FAA approved car seats and best FAA approved convertible car seats. We will have a close look at the top air travel car seats. 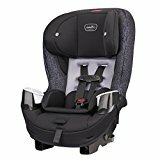 I will outline the features, the pros and cons of each in detailed travel car seat reviews, which should help you choose the best travel car seat 2019 has on offer for you. I would also check the sizing of the bulkhead seats before booking them to make sure it will fit. There is also a removable cup-holder on side, which will save more space and make it more compact. The seat is convertible and has a weight range of 5lb to 40lb when using rear-facing and a weight limit of 22lb to 65lb for forward-facing position. The Safety 1st Guide 65 Car Seat is one of the best cheap baby car seats for travel. It is lightweight and slim enough to fit on airplane seats. It has a wide weight limit so that you can use the seat for many years. The seat is definitely one of the best car seat for traveling on an airplane and the best car seat for airplane 2019 option. 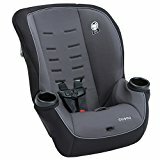 This is my pick for the best cheap car seat for travel and the best convertible car seat for air travel. Also available in: Chambers, Seaport and Sportfit! The Evenflo Tribute LX is a favorite because it is such an incredibly lightweight infant car seat. The Evenflo Tribute LX is the lightest car seat on our list. It compact and weights only 9 lbs. which is pretty incredible! The seat has been designed to fit on plane seats. It measures 18.5" so you might have to have the arm rest up on smaller seat planes. I would also suggest you check the width of the bulkhead seats as they tend to be slightly more narrow than normal seats. This carseat is convertible which means that it is suitable for newborns and is suitable for kids up until 18 months of age. The seat is great for kids up until the weight of 40 lbs. The Evenflo Car Seat is a great car seat for travel. It is compact and lightweight and at a width of 18.5" it will fit on most seats with the arms rests down. The seat will fit through the baggage security scanners. A great car seat with high safety ratings! Also available in: Saturn, Neptune and Azure Coast! 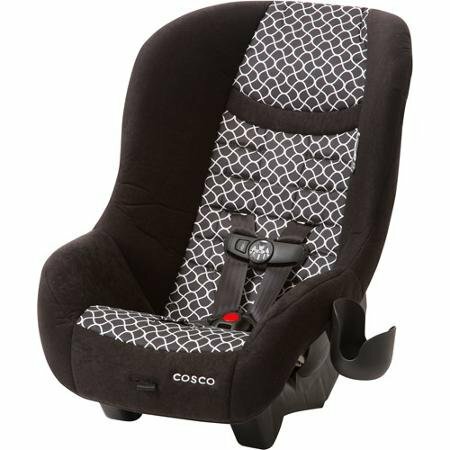 The Cosco Scenera NEXT is our pick for the best lightweight car seat for travel. It is of course a FAA certified car seat. It has the perfect combination of being cheap, light-weight, narrow, and easy to install on the plane. 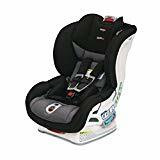 It has high safety ratings and it a bit taller in comparison to other cheap car seats, which means that the seat will last that bit longer before your little one hits the height limit. This inexpensive car seat weights only 8 lbs. which means that you can easily carry it with you through the airport. We still do recommend that you put it in a car seat backpack or a car seat roller like the Go-Go Babyz Travelmate to make life easier. The Scenera has a slim width of 17.5" which means that it will fit through the security scanners and it will also fit on most airplane seats with the arm rest down. The Scenera is a travel convertible car seat, which means that you can use this car seat in the rear-facing position for babies up to 35 lbs. and forward facing for little ones up to 40lbs. It is important to note that when you have this seat installed on the plane in the rear-facing position, the seat in front of the car seat won't be able to recline much. For this reason we recommend that you enquire with the airline to find out what the width is of the bulkhead seats. We do find that this seat will fit on the bulkhead seats on most planes (but not all). Booking a bulkhead seat would fix the problem of not allowing the passenger in front to recline (otherwise we might suggest that one parents sits next to the baby and one in front). Because of the incredibly cheap price tag on this seat, you can't expect quality. The material is more flimsy and tends to pop off the seat more easily. The seat is also more challenging to install, especially the first few plane installations. It is also important to note that the seat will only work with babies and not older kids as your weight limit is set at 40 lbs. Which is why we prefer the Guide 65 as it will last you up until 65 lbs. The Combi Compact Corroro is a hot seller amongst travellers due to its super slim design. This car seat will fit on any seat on any plane. It is lightweight and easy to carry around. If you don't mind the slightly higher price tag, then this might just be the best travel convertible car seat for you. This ranks as one of the best travel convertible car seat 2019 options, after all. The Evenflo Sonus is ideal for use as a travel seat on the airplane. 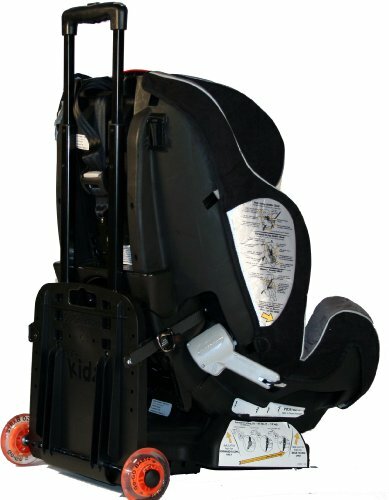 It is a FAA approved child restraint seat, it is lightweight (only 11 lbs.) and has a perfect width of around 18". The Sonus is a lovely light 11 lbs. It’s the perfect seat to cart through an airport, you might even get away with carrying it if you have to. The seat is 18" in width which means that it should fit on all plane seats. The seat can be used in rear-facing position from 5 – 40 lbs. and in the forward-facing position from 22 – 50 lbs. The Evenflo Sonus is a great car seat for air travel. It is pretty cheap, lightweight, slim enough to fit on seats but yet stylish enough to use in your car at home as well. Also available in: Charcoal, City Lights and Dahlia! Whilst this Chicco car seat is FAA approved, the only reason why I would recommend you use this seat for travel is because you already own the seat for car use. The seat is heavy, but the beauty is that it is slim enough to fit on the plane seats. The car seat is heavy at 25 lbs. So if you are using this car seat do make sure that you grab a car seat trolley as well. A lot of readers have reported that they had to lift and carry the seat over the top of the seats on the plane as it wouldn't fit down the aisle so keep that in mind as well. The baby travel car seat is lovely and slim and at 17.5" it should fit comfortably on most airplane seats. Because the seat is bulky though you will find that it fills up most of the space when in rear-facing position - which means the person in front of the seat will not be able to recline at all. Accommodates newborns and growing toddlers in rear-facing mode (5-40 lbs). Converts to accommodate older kids in forward-facing mode (22-65 lbs). As mentioned, I would only resort to using the Chicco Next Fit IX if I already own the seat. The car seat is slim enough to fit on plane seats, but it is bulky and heavy. It is a great car seat though, so if you are happy to cart the seat around, it would be a great investment (it is more pricey than other seats on the list). Another Cosco Car Seat FAA approved option for travel. I will come straight out and say that I would recommend you invest in the Scenera NEXT instead of this one, but many parents prefer this seat due to the fact that it is more comfy and cushioned. This car seat and lovey and light! At 9 lbs. it is one of the lightest car seats on our list. The main concern I have with this seat is that it is a touch wide at 22". As most seats on the planes are around 18" (some even smaller), you need to be aware that you will need to have the arm rest up in order to make this seat fit. The seat is converting and is great for babies up to 40 lbs. in the rear-facing position and for kids up to 50 lbs. in the forward-facing position. Whilst this seat has been certified for airplane use, I would recommend that you call up the airline and ask them about the width of their seats before you drag this wide 22" car seat along. It is a comfy seat and it is really lightweight. Gotta love the price tag, but I much prefer the smaller and more compact Cosco Scenera NEXT portable car seat for airplane travel instead. The Combi Coccoro is a great portable car seat FAA approved and with a good safety ranking. It is lightweight (12 lbs.) and really slim (15"). 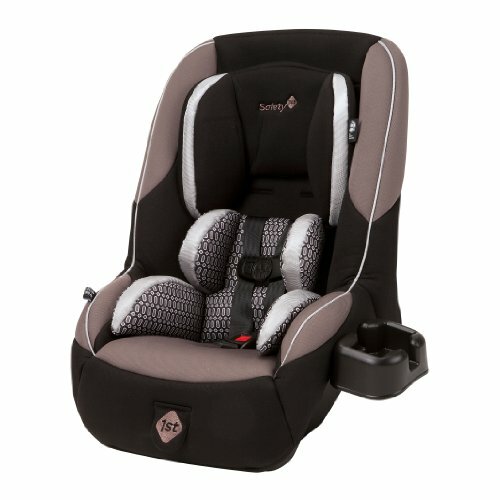 It is slightly more expensive than many of the other car seats on our list, but it is slightly more cushioned and comfy. 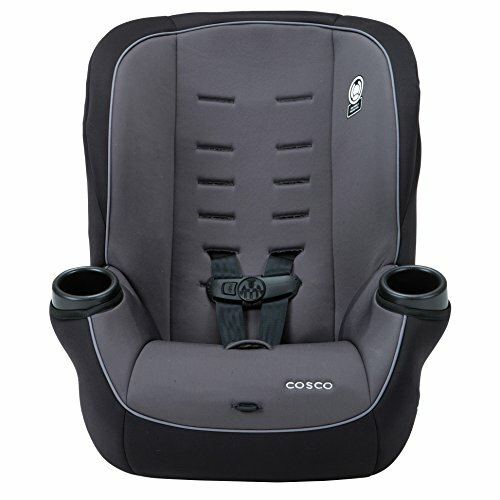 The Coccoro is a lovely lightweight car seat, weighing in at only 14 lbs. It is slightly heavier than other car seats such as the Cosco car seat, so we do recommend you invest in a car seat carrier. The Cosco car seat is compatible with the Baby Trend Snap N Go and the Go-Go Babyz Travelmate. The Coccoro happens to be the slimmest seat that we have on our list. It is only 15" wide which means that you will be able to use this seat on any plane and even in the bulkhead seats. It is a convertible car seat which means that you can use it in rear-facing to forward-facing positions. It has a a rear-facing weight limit of 33 lbs. and a forward-facing weight limit of 40 lbs. What we love is that you can use this FAA car seat in the rear-facing position and because it is so small the seat in front of it should still be able to recline. The car seat is a bit more pricey in comparison to the cheap infant car seats such as Cosco, Evenflo and Safety 1st. It also has a lower height (23") in comparison to Safety 1st, which means that your little one might grow out of it before they hit the weight requirements. As with many other car seats on the list, it can be tricky to install on the planes. The Cosco Scenera NEXT is a very popular travel car seat, because not only is it really cheap, but it also has high safety ratings. The car seat is convertible and will last your bubs up until 40 lbs. It is lightweight and slim enough to fit on most seats (with the arm rest down). The Evenflo Statos 65 is another great FAA approved car seat for plane travel. This car seat is slightly heavier and a tiny bit wider in comparison to the Evenflo Sonus up above. But it is still lighweight enough and slim enough to be considered as one of the top travel car seats for planes. The Evenflo car seat is a lovely and lightweight car seat, weighing in at only 13 lbs. The width of the car seat is 18.5", which means that the seat should fit comfortably on all plane seats, although you might have to lift the arm rests on the very narrow 16.5" seats. The Stratos Convertible Car Seat helps protect rear facing infants from 5-40 lbs., and forward facing toddlers from 22-65 lbs. The Stratos 65 is a great convertible travel car seat. It is suitable for babies and toddlers from 5 to 65 lbs. and offers 6 harness positions for a better fit. The seat is lightweight and slim. We also love that the seat features a revolutionary air flow ventilation system that provides a temperature-regulated, which means that your little one will be comfortable no matter what the season or temperature is of your destination. 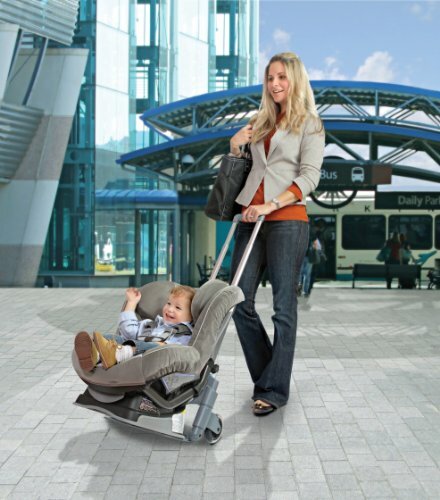 The Graco Size4Me is a great and lovely cushioned seat for travel. The Graco car seat is FAA approved and whilst many people assume you can't travel with it due to its widest width being 22", you can actually still fit it on most plane seats with the arm rests down due to the narrow base and the way it is shaped. The car seat is heavier than many other car seats on our list. It weighs 19 lbs. so do ensure you have a car seat trolley or car seat backpack to port it around the airport. Whilst the seat measures at 22" at the widest point, it does have a narrow base. Which means that the seat should fit beautifully (with the arm rests down) on the larger plane seats, but you will most likely have to fly with the arm rest up on the slimmer seats. 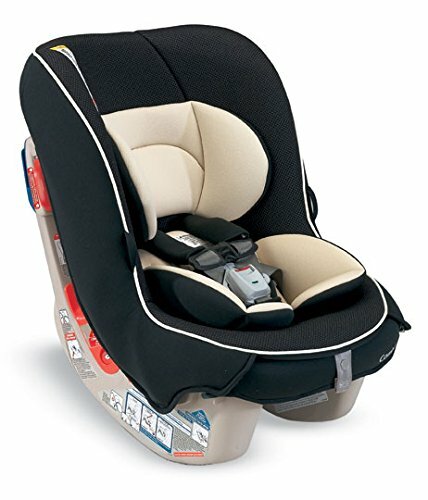 This car seat is great for 4-40 lbs babies in rear-facing position and 20-65 lbs. in forward-facing position. Which makes it a great travel toddler car seat. Be aware that it is on the heavier side, so don't try to carry it around the airport. Due the width, you might also have to lift it up over the seats when you walk down the aisle in the plane (although friends have reported that it does fit down the aisle of some planes). 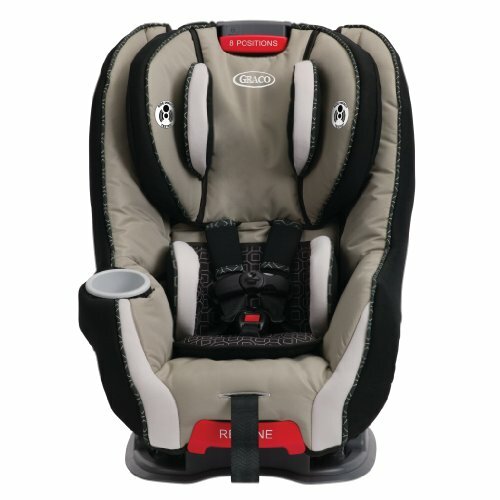 The Graco Size4Me 65 is a great portable toddler car seat to take along on trips. It fits beautifully on seats due to its narrow base and shape. It is also really easy to install and adjust. Important to note that it is slightly on the heavier side, but if you prefer a seat that is cushioned and super cosy for your baby, then we do recommend the Graco Car Seat. Britax also has a range FAA certified car seats, one of which is the Britax Marathon ClickTight, Verve. It is a more compact seat than some of the more bulky Britax designs, but it is still slightly on the heavier side. What we love about Britax is that it has a protective shell design. The Britax Marathon ClickTight is a heavier car seat in comparison to our other seats on the list. This seat weighs 28.4 pounds, so make sure that you invest in either the Britax car seat cart and the backpack style car seat bag for getting around in the airport. This Britax convertible seat measures at 18.5 inches in width, which means that it should fit comfortably on most airplane seats. The Britax is great for newborns babies in the rear-facing position, up until 40 lbs. in weight and the forward-facing position can hold a child up to 65 lbs. 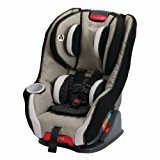 The Britax Marathon Click Tight Convertible Car Seat, Verve is a great car seat for travel. You have to be aware that the seat is heavier than other typical car seats, so make sure to grab a car seat trolley as well. Britax is a great brand and their quality car seats are more expensive due to the extra safety features that it has. 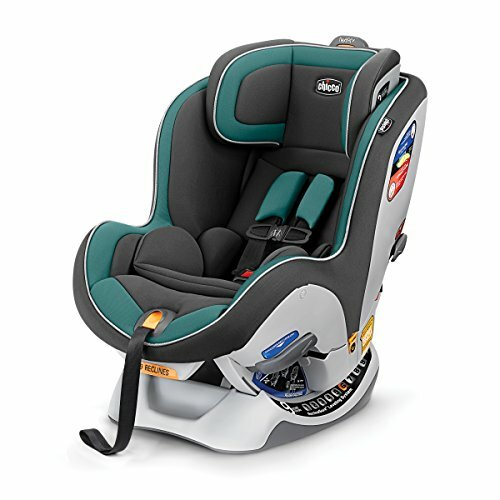 If you love Britax, then this travel car seat might just be for you! No matter how light the car seat is, I still suggest that you invest in either a car seat travel stroller or a backpack car seat bag to get around the airport. The Britax Travel Cart is one of the most popular travel carts for Britax car seat owners. It is a great car seat roller cart that allows seats to attach effortlessly using the car seat latch connectors. The one-hand telescoping handle is great as it adjusts to fit any height. It will fold down compact enough to fit into most airplane overhead compartments. The Britax car seat travel cart will work with all Britax convertibles and harnessed booster seats, as well as with most other brands. The cart is a lot heavier (20.8 pounds) in comparison to the Go-Go Babyz cart (5 pounds) down below. >>> Check pricing of this cart here. The Go-Go Babyz Car Seat Luggage Cart is a great cart for USA car seats. It works with both infant travel car seats as well as toddler convertible car seats. It has an additional fold down plate that you can use for larger car seats. You can adjust the handle, which is great as you can make it shorter when stored and lengthen it out to make it easier to push (it has 4 positions). It has wide-set 3" roller blade wheels which makes it easy to push along in the airport. 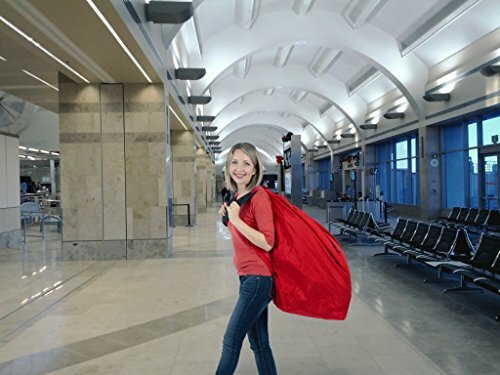 The Travelmate can be checked with your baggage, rolled to gate and checked, or rolled all the way on the plane to be used in flight or stored in the overhead compartment. Folds to 28 x 17 x 5 inches. Weighs 5 lbs. The Brica Sar Seat Roller Cart is great as it fits most major brands of convertible and forward-facing car seats. This best travel carseat stroller has a lightweight design. 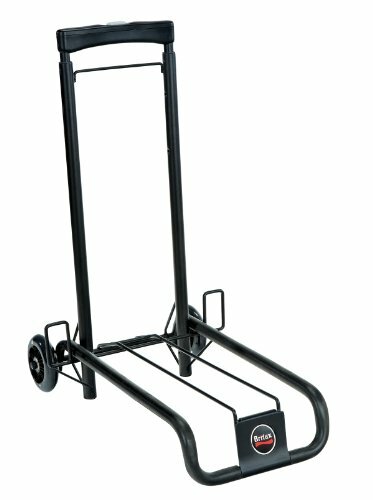 it has fold flat wheels as well as an adjustable telescopic handle which allows the cart to fold up in order to fit in an overhead locked on the plane. Weighing just 5 pounds, this transporter folds flat (2-1/2 inches thick) for easy storage. For a small alternative, you can consider this car seat travel strap. Simply connect your car seat to your rolling carry-on suitcase and off you go. Easy, although I would probably suggest you only use this option for the lightweight car seats. If you wish to check in your car seat, we highly recommend you purchase one of these top car seat bags for air travel. Some airlines might give you a thin plastic car seat cover for travel, but they offer no protective. The first time we traveled with our car seat, it got damaged so we never go without a protective baby car seat travel bag now. The JL car seat travel bag is a great option. It is durable and comes with a lifetime warranty. It is adjustable, has padded backpack straps and a lifting handle. The interior of the travel car seat bag is padded. It has dual and lockable zipper openings and an ID card pocket to pop all your details. >>> Check pricing of this bag here. 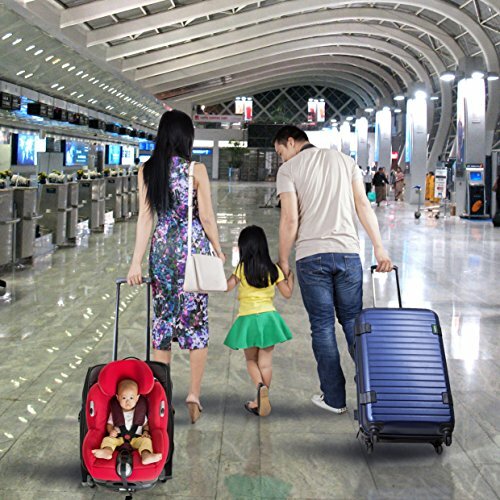 The Flightjoy Car Seat Bag for Travel is another great option. It has adjustable straps. The material is heavy duty, durable and will last. It is compatible with most baby car seats. 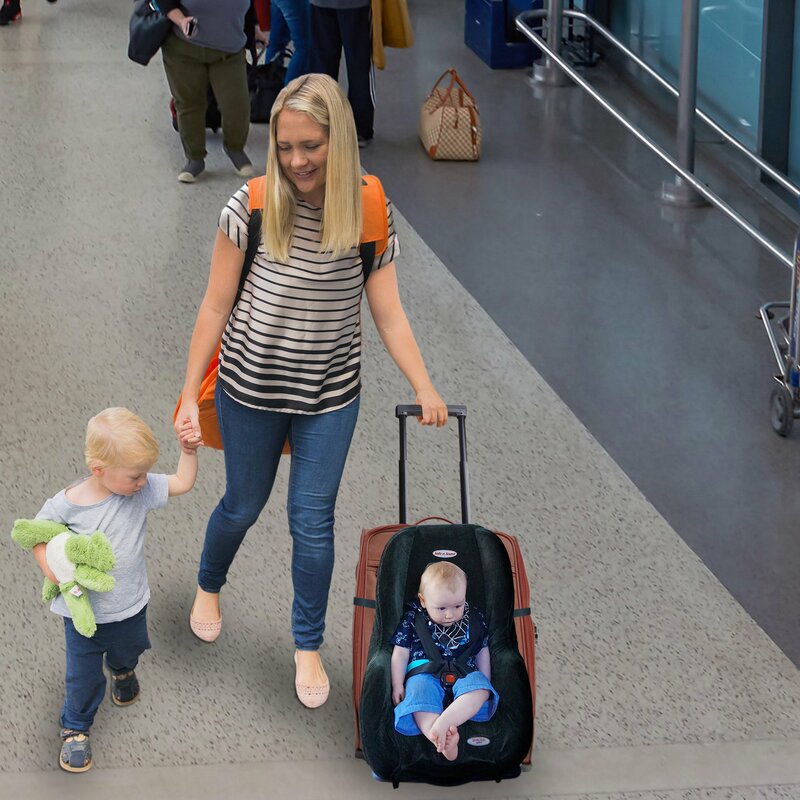 These infant car seat travel bags are also airline approved so you can carry it through the airport terminal gates when you want to use the seat on the airplane itself. 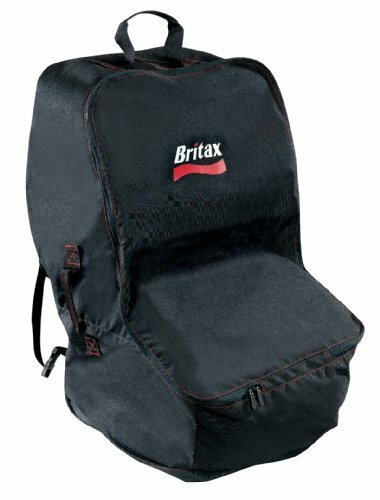 The Britax Car Seat Airplane Bag is great for Britax car seats. The brilliant thing about this bag is that it has built-in wheels. The car travel bag is light and has several straps to make it easy to carry. It is waterproof and comes at a pretty affordable price tag. The Jeep Airplane Car Seat Bag is a great universal car seat travel bag. It is nice and large in size to fit even the bulkiest of seats. It has shoulder straps and made from quality durable fabric. it is also waterproof and lightweight. You can also choose to invest in the Jeep car seat travel bag with wheels if you prefer. 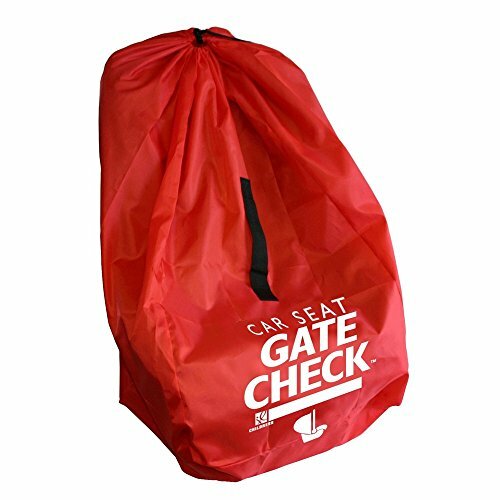 After a simple, no-frills car seat gate check bag that will get the job done? Then the JL Childress Car Seat Check Bag is for you. 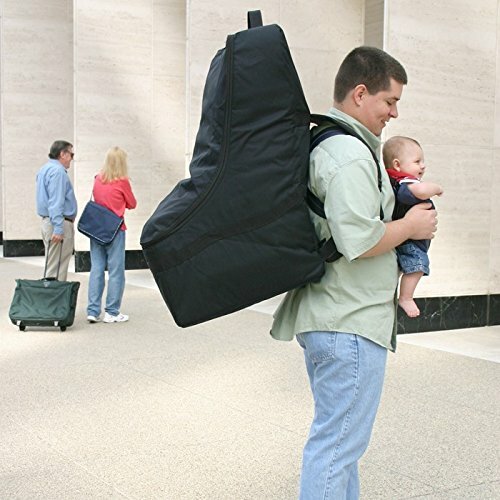 It’s lightweight and easy to carry. It is large enough to fit most car seats. Simple, but effective and affordable.